Clear November night skies offer incredible celestial sights for stargazers to be thankful for, so bundle up and get outside for stargazing fun! Brought to you by Orion Telescopes and Binoculars. On the night of November 5, the Taurids Meteor Shower will peak and with an early setting moon, there should be desirable dark skies for viewing. Look near the constellation Taurus, but be aware that meteors can appear anywhere in the sky. 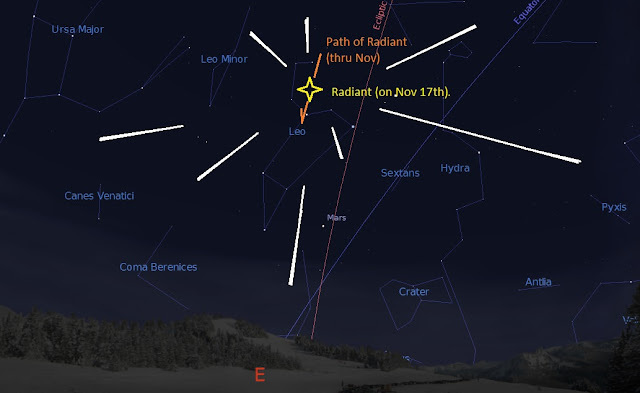 Radiant of the Leonid Meteor Shower - Illustration by Universe Today. 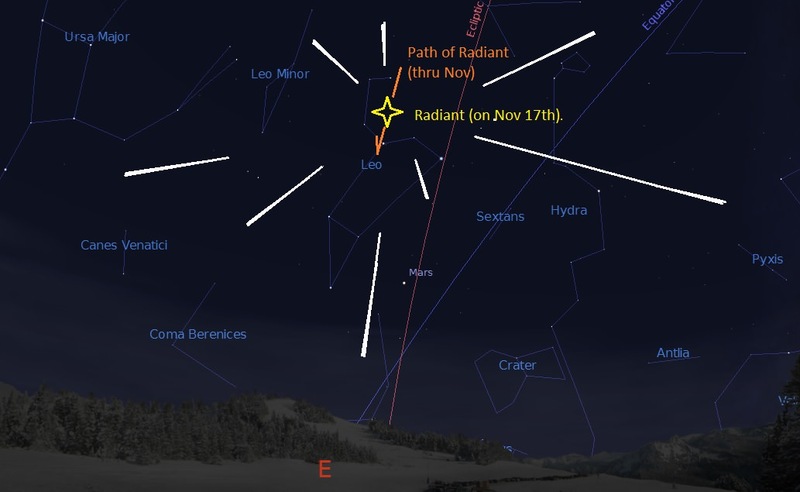 Bundle up and get outside after midnight on November 17th to see the peak of the Leonids meteor shower as "shooting stars" appear to radiate outwards from the constellation Leo. The waxing gibbous Moon will set shortly after midnight, so the best time for meteor-gazing will be in the wee hours of November 18th when the skies will be nice and dark. 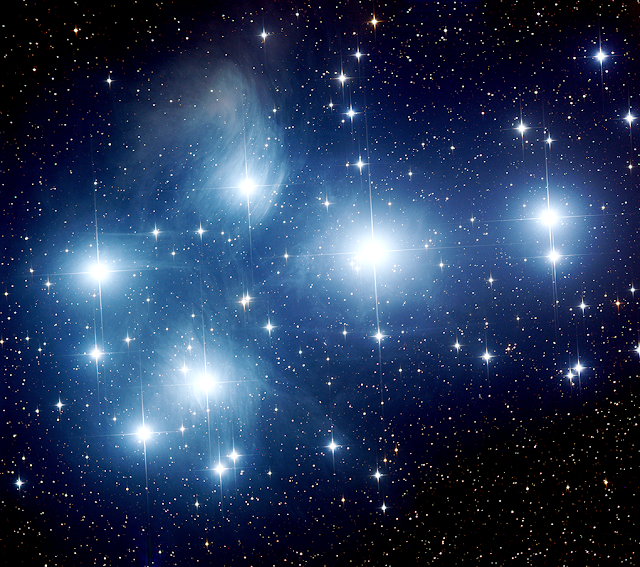 M45 - The Pleiades (the Seven Sisters) - Image by Insight Observatory. November is sometimes called "The month of the Pleiades," since the star cluster is visible all night long for observers in the Northern hemisphere. From a dark sky site, M45 is easy to see with the unaided eye and resembles a small "teaspoon" pattern in the sky. Use astronomy binoculars for immersive views of this open star cluster, or use a telescope with a lower-power eyepiece for a closer look at the Seven Sisters. The next night, November 6, will be the best time to observe the smallest and innermost planet in the Solar System as it will be at its greatest eastern elongation. It'll be low in the western sky shortly after sunset. This is the best time of the month to observe the fainter deep-sky objects such as galaxies and star clusters because there is no moonlight to interfere. Use a pair of big binoculars or a shorter focal length telescope with a wide-field eyepiece in November to seek out the sparkling Double Cluster in Perseus - two side by side open star clusters NGC 884 and NGC 869.